THE HEAVY RAIN HAS ENDED. FLASH FLOODING IS NO LONGER EXPECTED TO POSE A THREAT. PLEASE CONTINUE TO HEED ANY REMAINING ROAD CLOSURES. [SAT 4:45 PM] -- Dubois County -- tree down near 700 East and 400 South. High water at 3rd and Industrial. Car had to be pulled from water. [SAT 4:10 PM] -- NWS reporting damage on north side of Tell City. Possible tornado touchdown. [SAT 3:45 PM] -- TORNADO WARNING PERRY COUNTY. AT 239 PM CDT, A SEVERE THUNDERSTORM CAPABLE OF PRODUCING A TORNADO WAS LOCATED OVER TELL CITY, MOVING NORTHEAST AT 30 MPH. HAZARD...TORNADO. SOURCE...RADAR INDICATED ROTATION. IMPACT...FLYING DEBRIS WILL BE DANGEROUS TO THOSE CAUGHT WITHOUT SHELTER. MOBILE HOMES WILL BE DAMAGED OR DESTROYED. DAMAGE TO ROOFS, WINDOWS, AND VEHICLES WILL OCCUR. TREE DAMAGE IS LIKELY. * LOCATIONS IMPACTED INCLUDE... TELL CITY, TROY, RANGER, LILLY DALE, TERRY, GATCHEL, AND FENN HAVEN. PRECAUTIONARY/PREPAREDNESS ACTIONS... TAKE COVER NOW! MOVE TO A BASEMENT OR AN INTERIOR ROOM ON THE LOWEST FLOOR OF A STURDY BUILDING. AVOID WINDOWS. IF YOU ARE OUTDOORS, IN A MOBILE HOME, OR IN A VEHICLE, MOVE TO THE CLOSEST SUBSTANTIAL SHELTER AND PROTECT YOURSELF FROM FLYING DEBRIS. The National Weather Service in Louisville has issued a * Severe Thunderstorm Warning for... Southwestern Perry County in south central Indiana... North central Hancock County in central Kentucky... * Until 300 PM CDT. * At 234 PM CDT, a severe thunderstorm was located south of Tell City, moving northeast at 30 mph. HAZARD...60 mph wind gusts. SOURCE...Radar indicated. IMPACT...Expect damage to roofs, siding, and trees. * Locations impacted include... Tell City, Hawesville, Cannelton, Petri, Adair, Lilly Dale, Fenn Haven, Gatchel, and Gerald. At 229 PM CDT, a strong thunderstorm was located near Hawesville, moving northeast at 25 mph. Wind gusts up to 50 mph are possible with this storm. Locations impacted include... Tell City, Hawesville, Lewisport, Cannelton, Troy, Petri, Adair, Lilly Dale, and Fenn Haven. Torrential rainfall is also occurring with this storm, and may cause localized flooding. Do not drive your vehicle or walk through flooded roadways. [SAT 3:18 PM] From INDOT.... "We’ve already had some flash flooding reported in Knox County on State Road 550. Please if you encounter a flooded road call 911 and then turn around. Even driving through a small amount of water could prove deadly. #TurnAroundDontDrown"
Remember, 200 West just south of Huntingburg is flooded. Signs are being put out. [SAT 2:45 PM] We are hearing our first reports of flooded roadways. Scanner traffic reports 200 W just south of Huntingburg is now flooded. Police and county highway en route to confirm. Heavy rain continues to batter the area and it will continue through the evening. We will keep you posted of other developments. Stay tuned. Big Blue River...Big Walnut Creek...Buck Creek...East Fork White River...Flatrock River...Mill Creek...Big Raccoon Creek...Sugar Creek...White Lick Creek...Youngs Creek...Eagle Creek...Fall Creek...Deer Creek...Mississinewa River...South Fork Wildcat Creek...Wabash River...Wildcat Creek... .Significant river flooding is possible in across portions of central and southern Indiana next week. Widespread significant flooding is likely through through at least September 15 in western and southern Indiana. Rivers will continue to rise over the next several days with flooding beginning on smaller creeks and rivers this weekend. Widespread areas of two to four inches of rain fell across central Indiana Friday into Saturday with a few locally higher amounts. Additional rainfall of three to five inches is expected from now through Sunday evening. Current forecasts are based on expected rain and will change based on where the heaviest rain falls. People with interests along rivers and creeks should keep a close eye to forecasts over the next several days. At Sat 11:30 AM the stage was 3.2 feet. At 24.0 feet...Roads that flood include, East and West River Road, Spout Spring Road, State Road 550 in two places, a county road near Beech Creek, Chicken Farm Road and Cemetery Road. High water forms at least one island. Two families must walk or take boats to leave. One county road in Dubois County floods. Precautionary/Preparedness Actions... Motorists should never drive into flood water. Turn around and go another way. Keep children away from flooded areas. Recreational and agricultural interests should remain alert to changing river conditions. [SAT 12:00 PM] All activity at IMS is postponed for today. Brickyard moved to 1 p.m. Xfinity Race moved to Monday at 10 a.m.
* Until 530 PM EDT/430 PM CDT/. * At 1133 AM EDT/1033 AM CDT/, Doppler radar indicated heavy rain moving into the area that will cause minor flooding. * Some locations that will experience flooding include... Jasper, Paoli, English, Carefree Town, Mount Pleasant, Huntingburg, Ferdinand, Orleans, French Lick, and Stampers Creek. * Turn around, don't drown when encountering flooded roads. Most flood deaths occur in vehicles. Keep children away from storm drains, culverts, creeks, and streams. River banks and culverts can become unstable and unsafe. [SAT 11:18 AM] FROM THE INDIANAPOLIS MOTOR SPEEDWAY: FGL FEST AT IMS FOR TODAY HAS BEEN CANCELLED DUE TO WEATHER. TICKETS CAN BE REFUNDED IF PURCHASED ONLINE, CREDIT WILL BE ISSUED IF BOUGHT FROM A POINT-OF-SALE VENDOR. [SAT 11:13 AM] FLASH FLOOD WARNING .... Daviess, Martin Counties locally until 4:45 p.m.
* Until 445 PM EDT Saturday. * At 1041 AM EDT, Doppler radar indicated showers and thunderstorms producing heavy rain moving into the warned area. 1 to 3 inches has already fallen across much of the lower Wabash Valley and south central Indiana since Friday. An additional 1 to 3 inches of rain with locally higher amounts is expected into the afternoon. Flash flooding is expected to begin shortly. * Some locations that will experience flooding include... Vincennes, Washington, Linton, Sullivan, Bloomfield, Shoals, Bicknell, Loogootee, Jasonville, Worthington, Odon, Shelburn, Dugger, Hymera, Lyons, Carlisle, Elnora, Oaktown, Monroe City and Wheatland. At 948 AM CDT, Doppler radar indicated heavy rain that will cause minor flooding in the advisory area. Some locations that will experience flooding include... Evansville, Owensboro, Princeton, Mount Vernon, Boonville, Newburgh, Chandler, Fort Branch, Oakland City, Petersburg, Rockport, Melody Hill, Dale, Haubstadt, Darmstadt, Owensville, Poseyville, Lynnville, Winslow and New Harmony. Additional rainfall of 1 to 2 inches is expected over the area, isolated higher amounts possible. This additional rain will result in minor flooding. [SAT 10:50 AM] -- Jasper is right on the edge of the severe weather potential today (areas in dark green have the best chance of seeing a severe thunderstorm today into tonight as the remnants of Gordon push through. Damaging wind gusts and a brief tornado or two are the main severe weather threats, according to the National Weather Service.
" Everything is a go for today rain or shine, unless there is a severe weather warning issued then we must close until its expired. If it is raining at the time of the BMX show then that particular show will be postponed. THE SILLY SAFARIS ANIMAL SHOW will be MOVED to the Dale Community Center Gym which is behind the library. We will keep you posted if something changes. Enjoy the Dale Fall Fest!!!" [SAT 8:52 AM] - Jakes Day has been cancelled today due to the amount of rain forecast. Organizers will work on a possible make up date. [SAT 6:00 A.M] Jasper Engines' Softball Tourney has been cancelled due to today's rain. [FRI 10:15 PM] SPORTS -- Due to heavy rains from the remnants of T.S. Gordon, Friday night's Jasper Football match up against Heritage Hills has been rescheduled for Saturday at 3 p.m.
Because of the change, we will not be airing girl's soccer and we will not be covering the Xfinity Race so we can bring you our local high school football action. Stay tuned. This schedule could change based on Saturday's weather. At 954 PM EDT/854 PM CDT/, a strong thunderstorm was located 13 miles southwest of Carefree Town, moving east at 15 mph. Winds in excess of 30 mph and torrential rainfall are possible with this storm. Locations impacted include... Mount Pleasant, Leopold, Alton, Roberta, Oriole, Derby, Beechwood, Magnet, Gerald and Chenaultt. Torrential rainfall may cause localized flooding. Do not drive your vehicle through flooded roadways. Be especially cautious at night when flooding is more difficult to spot. [FRI 9:47 PM] -- To summarize the new River Flood Warning... Some areas locally have reported up to 6 inches of rain so far with an additional 4 -6 inches expected through Sunday. That would put totals up to a foot of rain in some areas. Portions of Huntingburg are reporting (unofficially) 6 inches. 5 inches at the Monastery in Ferdinand. This is a potentially dangerous situation. Stay tuned through the weekend for the latest developments. Big Blue River...Driftwood River...East Fork White River...Flatrock River...Muscatatuck River...White River...Wabash River...Wildcat Creek...Eel River... .
Major river flooding is possible in a few areas of central and southern Indiana next week. Widespread significant flooding is likely through through at least September 15 in western and southern Indiana. Rivers will continue to rise over the next several days with flooding beginning on smaller creeks and rivers this weekend. Widespread areas of one to two inches of rain fell across central Indiana Thursday and Friday with locally higher amounts up to six inches. Additional rainfall of four to six inches is expected from now through Sunday evening. Current forecasts are based on expected rain and will change based on where the heaviest rain falls. People with interests along rivers and creeks should keep a close eye to forecasts over the next several days. The National Weather Service in Indianapolis has issued a * Flood Warning for the White River at Edwardsport. * from Monday morning until further notice. * At Fri 07:00 AM the stage was 4.3 feet. * Flood stage is 15.0 feet. * Minor flooding is forecast. * Forecast...Rise above flood stage by Monday morning and continue to rise to near 19.1 feet by Friday September 14. * At 18.6 feet...During June 2010 and March 2011 high water...INDOT closed SR 358 between SR 67 at Edwardsport to SR 57 at Plainville. SR 358 floods on the east side of the river between the levees. [FRI 9:34 PM] -- A reminder, the annual Touch-A-Truck event, scheduled for Saturday in Jasper, has been postponed due to the threat of heavy rain this weekend. The event has been rescheduled for Saturday, September 15th. * Until 1015 PM CDT. * At 814 PM CDT, Doppler radar indicated heavy rain due to thunderstorms. This will cause minor flooding in the advisory area. Up to 1.5 inches of rain has already fallen. Ponding of water on roadways and flood prone locations is possible. * Some locations that will experience flooding include... Leopold, Ranger, Sassafras, Bristow, Celina, Terry, Saint Croix, Adyeville, Apalona and Siberia. [FRI 9:18 PM] - Just to show you how much worse our flooding situation could be than expected, check out the rainfall totals put out by the National Weather Service today. Jasper was only supposed to see 3-4 inches of rain through Sunday. So far listeners have reported (from their home rain gauges) Huntingburg 6" .... Ferdinand 5" . Again, these are not official totals but it just goes to show how tricky the next 48 hours could be here in Dubois and surrounding counties. [FRI 9:05 PM] -Listener Sonda Schroeder Simpson reports 6" of rain has fallen in her rain gauge since 4:30 this afternoon. That already tops total storm estimates through Sunday. We need to take this more seriously than we initially thought. Rainfall rates are much higher than expected. At 834 PM EDT/734 PM CDT/, a strong thunderstorm was located 8 miles east of Holiday World, moving northeast at 10 mph. Winds in excess of 30 mph and torrential rainfall are possible with this storm. Locations impacted include... Ranger, Adyeville, Sassafras, Bristow, Celina, Apalona, Siberia, Uniontown and Kitterman Corners. At 803 PM EDT, a strong thunderstorm was located near English, moving north at 15 mph. Winds in excess of 40 mph and torrential rainfall are possible with this storm. Locations impacted include... English, Marengo, Hardinsburg, Ethel, Trotter Crossing, Valeene, Pine Valley, Taswell, Chambersburg and Bacon. Torrential rainfall may cause localized flooding. Do not drive your vehicle through flooded roadways. [FRI 8:10 PM] - Here is what we know right now.... Holiday Foods in Ferdinand closed early this evening due to high water. An employee tells WITZ Radio News that water came in the back door of the store. There is no damage but there is a "big mess to clean up." The store is expected to reopen Saturday morning. Listeners have already reported UNOFFICIAL rainfall totals already from this storm. One from Huntingburg reported 4 inches of rain. We also received a report from the Monastery in Ferdinand of 5 inches (remember, the NWS said we would get 4 + inches by Sunday). It appears this could get worse than expected so stay tuned for further developments. 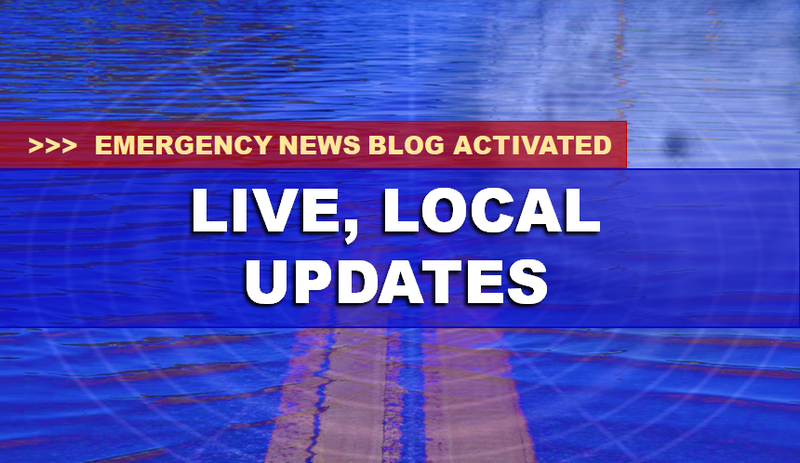 [FRI 8:00 PM] - Due to flooding that is already occurring, news director David Shepherd has activated our Emergency Live News Blog. Follow this story to be updated on any flood reports, damage, closed roadways, warnings and other vital information for Dubois and surrounding counties. Please share on social media to spread the word to family and friends about the impending weather situation as it will only get worse from here.